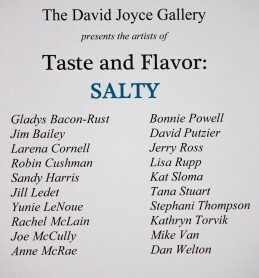 Lane Community College is holding it’s winter installment of the Taste and Flavor Exhibit at the David Joyce Gallery. The David Joyce “Flying People” mural installation at The Eugene Airport. 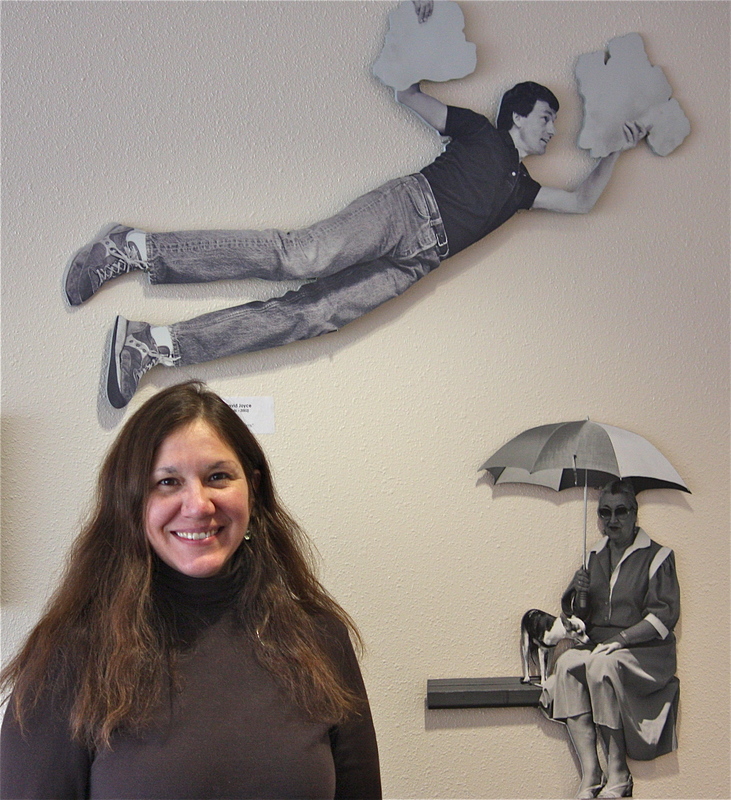 (behind Julie Fether – Special Projects Coordinator at LCC). 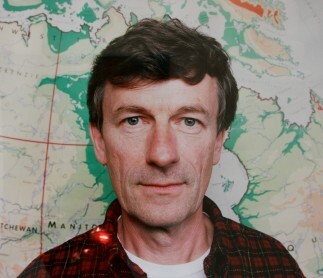 David Joyce was a well respected and loved teacher. He taught arts and media at LCC for 25 years, retiring in 2001 after he was diagnosed with Non-Hodgkins Lymphoma. David is most known in the local community for his Flying People Mural at the Eugene Airport. As you walk up the stairs to the second level to the gallery, you are first greeted by a photograph of the artist himself, his “flying people” carry you on into the gallery. Stop and take a look at what his students and colleagues have written about him as you reach the top of the stairs. 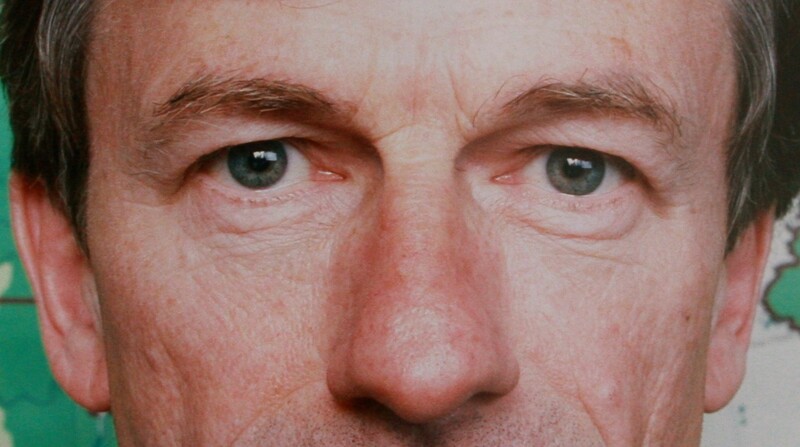 He truly was a very special person. David succumbed to the Lymphoma and passed in 2003. 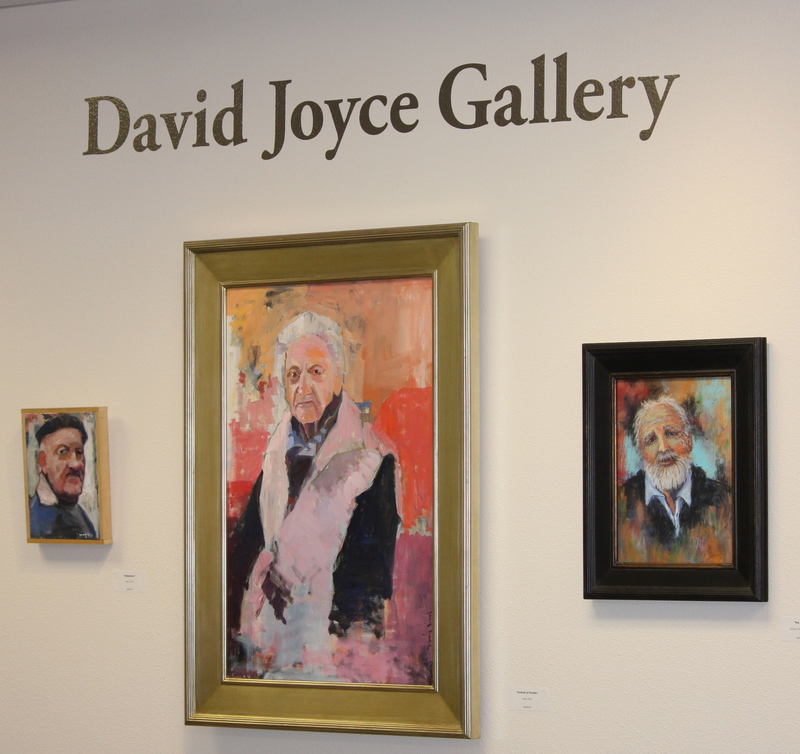 September of 2005 in honor of Joyce, LCC dedicated and named the new art gallery the “David Joyce Art Gallery”. The first exhibit held at the gallery, located in the Center for Meeting and Learning at LCC was in the fall of the same year. This annual exhibit has continued since and has grown by leaps and bounds. I spoke with Julie Fether, Special Projects Coordinator of the Conference and Culinary Services of LCC, who has been in charge of the exhibit since 2008 and has seen the exhibit expand and mature over the years. “it is so very different each and every year” Fether states. Each year a new exhibit theme is named, holding three installments, Fall, Winter and ending with the third installment in Spring, which lasts through the summer months. This year the Taste and Flavor exhibit began with “Spicy”, the winter exhibit “Salty”, is being exhibited now and runs until March 22, 2013, finishing the theme with “Sweet” opening March 25th. The winter exhibit “Salty” is the biggest show the gallery has ever held, with 20 artists and over 50 pieces of art work. Featuring well known artists, new artists, staff and faculty. 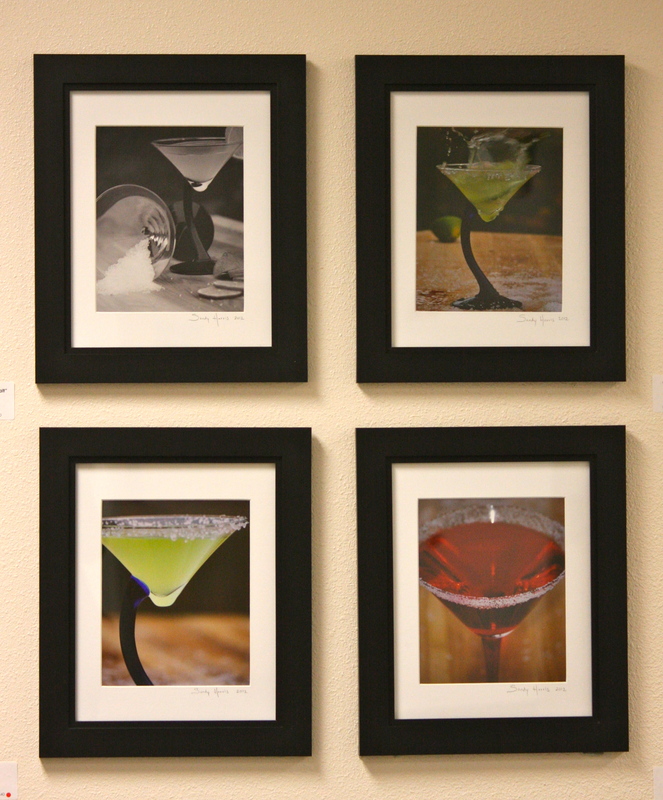 Artists were encouraged to submit work that reflected salt or salty / saltiness and what it means to them. 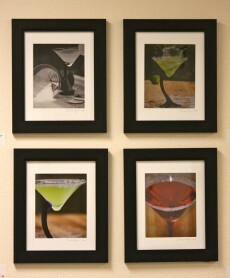 Each exhibit is a juried show, meaning the artists must be “approved” into the show. There is a process that takes place within the 5 person jury, who must decide not only on the quality of the work that is being submitted, but how all of the pieces will come together as one exhibit. In speaking with Fether, she stated it is quite the feat to put a show together. It all starts approximately 2 months before the exhibit goes up on the walls. The process for the Spring exhibit has already begun early January of this year. The artwork mediums, ranging from photography, “macchia” style oil, water, textiles and bead work is for sale. 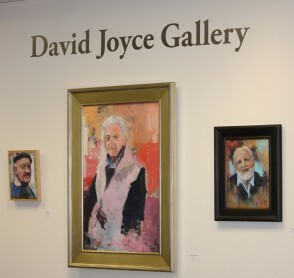 The David Joyce Gallery will receive 25% commission per piece that is sold. The commission is then used towards the next exhibit for hanging supplies and to retain Susan Detroy. Susan is an art consultant, work installer, designer, coordinator, manager, and project manager for both profit and non profit organizations. Susan is a vital part of each and every exhibit. She is the person who pulls all of the artwork together, coordinates the volunteers and ensures the exhibit goes up on the walls as smoothly as possible. “We count on volunteers to help make each exhibit happen. This was a huge exhibit, so we needed every bit of help we could get, which usually comes from the artist’s themselves that are in the exhibits.” Fether states. An artists reception will be held Thursday, March 7th from 4:30 p.m. – 6:00 p.m. in the David Joyce Gallery, located on the second floor of the Center for Meeting and Learning at LCC building 19, located just to the right of the main campus building one. Complimentary hors d’oeuvres and refreshments are prepared and served by the culinary students, a cash bar will also be available. The reception is open to the public. Coinciding with the artists reception, the Lane Community College Culinary Arts and Hospitality Management program, which is housed in the same building as the Gallery will be presenting its 2013 International Classical Cuisine dinner “A Feast for the Elements” featuring Chinese cuisine. Culinary students will pass hors d’oeuvres beginning at 5 p.m., with dinner being served at 6 p.m. The gourmet Chinese dinner includes entertainment and will be held on the first floor of the Center for Meeting and Learning building. You can purchase a ticket for the dinner for $35.00 per person or $250.00 for a table of eight. If you are interested in submitting artwork for the upcoming Taste and Flavor “Sweet” exhibit, submissions are due on Tuesday, February 19 at 5 p.m. Please contact Julie Fether at [email protected] for the request for proposal form needed for your submission. You can view the exhibit Monday through Friday 8 a.m. – 5 p.m. located at LCC 4000 East 30th Ave. Eugene, OR. Building 19. 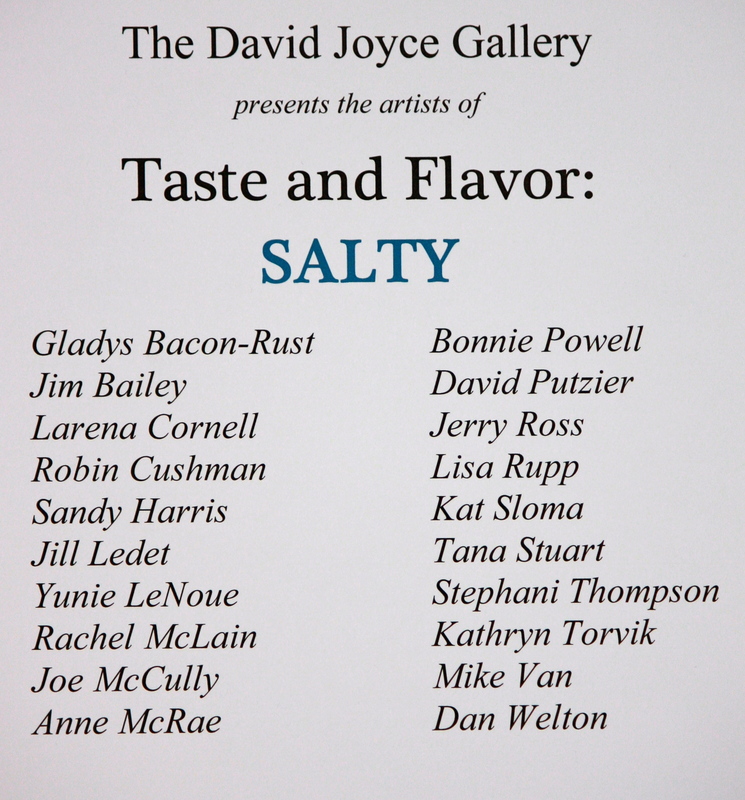 For more information, please call (541) 463-3518 regarding the David Joyce Gallery or artists reception. First Team 6A All-State Selection Signs with Titans. Sandy Harris is a writer for Eugene Daily News. Sandy grew up on an island in the Alexander Archipelago in the southeastern region of Alaska. Her life's passions include writing and photography. Follow her on (http://sandralynnsphotography.blogspot.com/). Out and About: Wanna Race?